Half time betting is one of the best gambling markets because you get to see the game first and this leaves you in a better position to make predictions. What also makes this betting market exciting is things can either flip after halftime or stay the same. As much as educated bets can be made, it is equally unpredictable. 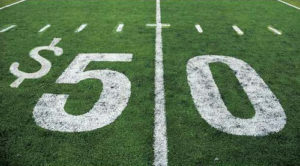 This halftime betting guide explores how the strategy works, how to use the betting strategy and which sports work best with this type of betting. Halftime bets are made on a part of a game. Whether the sport you are betting on is broken up into quarters or halves is immaterial. Bettors can bet on the quarter or half of the game. Halftime bets are very similar of bet to scorecast bets because bettors have to predict the end of the half of a match. There is a small window of opportunity to make decisions between each half of the game; therefore players need to be familiar with the betting market. As we mentioned earlier, players need to be very aware of the betting market they have chosen. They also need to factor in all the events that may have transpired in the first half. If there are injuries or penalties then some players may have been sent off and that significantly changes the shape of the game. There 7 questions that US gamblers interested in Halftime line bets must address in making decisions. Did any injuries occur in the first half? Were there any penalties and/or turnovers which altered the score and/or total? Does one team seem to have more momentum? Was the first half extraordinarily bad or great for one team? Did the teams stick to their original gameplay plans? If not have one or both teams started modifying to match the opponent’s (new) game play plan ? Is the weather now affecting the game? Consider all these questions before placing a halftime line bet. Take notes throughput the first half if you plan on placing a half time wager. Also stay on the internet and compare your information with what the bookies stats are. Remember that both the gambler and the sportsbook are likely have the same information because they both watched the game. So, no one has the upper-hand in terms of the games stats. Where to use Halftime Bets? Halftime bets can be used on any game separated into two or more periods you can bet at a variety of different sports. The halftime bet is naturally popular with games like soccer, rugby, football and many games that are divided into two or more periods. There are special variants of halftime line bets for games such as ice hockey which are played in thirds. Some sportsbooks allow players to use the halftime line bet as it is to bet on the results of one of the thirds of a standard ice-hockey games.